By clicking on 'Arrange a Quote', you agree to our Terms on data collection. 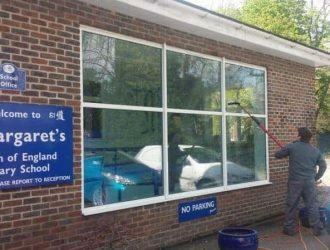 When you are looking for Nationwide Commercial Window Cleaning simply call us on 0800 1577484 to discuss your window cleaning requirements further. 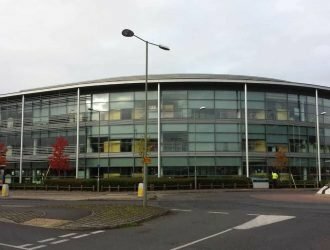 Choosing a reliable window cleaning company is essential for todays facilities managers who depend on top class window cleaning services for their customers premises. There really is something about a building with perfectly cleaned windows, it looks fantastic, shines and sparkles. Everybody smiles when they look through clean glass, and it makes you look out into the world with a positive attitude, it also makes your customers see you in a better light when they pull up in front of your building. 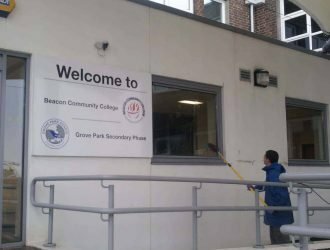 Should you require a free site survey for your buildings window cleaning requirements you should look for an experienced window cleaning company, one who understands different window cleaning techniques and access methods. 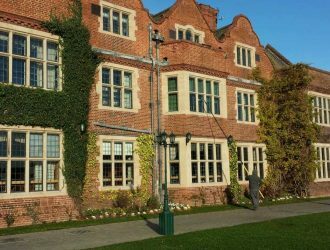 Many buildings windows can be cleaned by utilising the water fed pole method to safely reach and clean all types of windows perfectly leaving them sparkling clean. 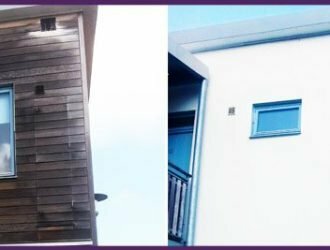 Some buildings windows will need to be reached by using abseiling techniques and you should only trust a company who has level three Irata qualified technicians in its employ. 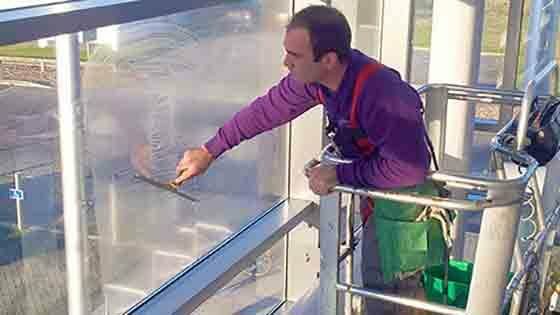 Cradles are also often used to reach and clean windows on modern buildings especially in London and other major towns and cities, induction must be provided to the user by the building manager or his qualified instructor. 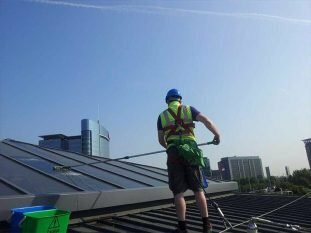 Traditional methods such as using a squeegee are still used today, mainly for internal windows on schools, office buildings and hotels. There are many types of squeegees out there with over thirty different manufacturers at the last count. 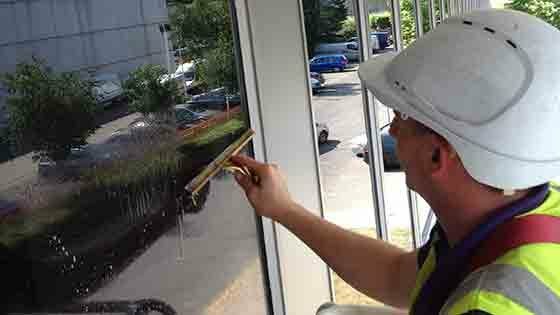 Using the very best rubber whichever squeegee is used will help get the very best window cleaning results. Using the finest surfactant will ensure the squeegee glides over the dirty window leaving you with smear free and sparkling windows. 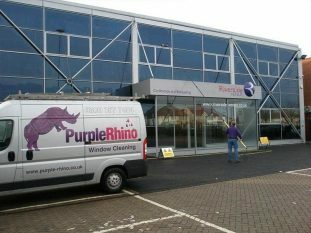 Purple Rhino are expert commercial building window cleaners and we cover most areas of the UK. 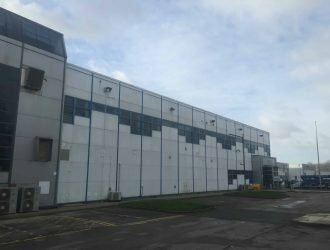 We are one of the countries independently owned window cleaning companies that is UKAS Accredited to ISO 9001 standards in commercial building window cleaning. 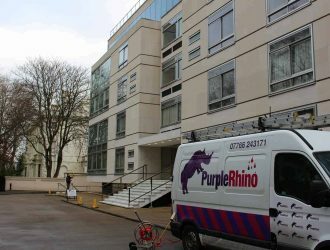 As always Purple Rhino provide excellent access solutions as well as giving excellent results with the proven techniques they use.